Walleye fishing is a complex subject, but fortunately there are only a few hook designs every walleye angler needs to embrace including Octopus, Treble and Slow Death. Fish hooks are all created equal right? At first glance it does seem like one fish hook is as good as the next, but upon closer inspection the reality sets in. Fish hooks designed for walleye fishing are as different as the lures and live baits they get paired with. To be brutally honest, “hooks” are the one piece of gear we could not catch a fish without. It’s also true that most anglers give their hooks little more than passing attention, preferring instead to worry about more glamorous topics like lures, line, lure color, electronics and on and on again. Paying attention to the fundamentals routinely helps the Fishing 411 crew stay on fish and catch more walleye. Picking the right hook for the job is one of those fundamentals many anglers overlook. Just about every crankbait and trolling lure on the market comes factory equipped with treble hooks. To keep the cost of these lures modest, many manufacturers equip their lures with “bargain” treble hooks. In the trolling game using “sticky sharp” hooks is the hands down best way to insure the fish that bite end up flopping in the bottom of a landing net. 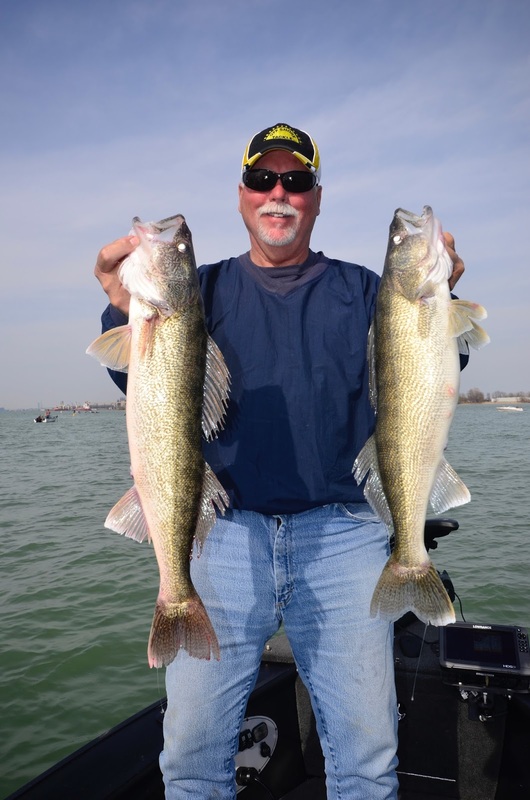 Because most walleye trollers are getting their lures out to the side of the boat with the help of planer boards, when a fish bites there is no opportunity to “set the hook” as in other fishing methods. Hooking these fish is largely about using hooks sharp enough to penetrate with minimal pressure. Most hooks, even many of the brand new hooks that grace fishing lures, are far from being “sticky sharp”. Lots of anglers compensate by physically putting an edge on their hooks with a flat file. Other anglers prefer to sharpen using a hone with a grove that cradles the hook shaft. Hold the hook with the point facing away from you and make three or four passes with a file. A file removes material quickly, so tread lightly when filing hooks. A hone removes material more gradually and generally requires a few more passes to achieve the same results as a flat file. Because a file can quickly remove too much material and ruin a hook, many veteran anglers favor using a hone to sharpen their hooks. Sharpening hooks is an acquired skill that takes time, patience and more importantly the willingness to attack this never ending job. To avoid all this filing and honing of hooks, a growing number of anglers switch out the hooks that come on their favorite lures for after market premium quality hooks. Virtually every major manufacturer of fishing hooks sells, “premium quality” hooks these days that are factory sharpened using a variety of different technologies to be “sticky sharp” right out of the package. Founded in 1925 and the only company to make fish hooks in America, Eagle Claw is the nation’s most recognized brand when it comes to fishing. In the premium hook category Eagle Claw produces the Trokar series of surgically sharpened hooks and also the Lazer Sharp series of needle point hooks. Considered by many to be the sharpest hooks in the world the TroKar and Lazer Sharp series offers anglers a wide variety of hook types and sizes to choose from. the best way to convert every bite into a hooked and landed fish. To say these hooks are sharp is an understatement. Since I started using Trokar treble, octopus and slow death hooks I’ve got in the habit of carrying Band-Aids in my wallet. I’m living proof that it’s not just the fish that bleed when coming in contact with these exceptionally sharp hooks! The biggest down side to super premium hooks is the cost. This goes double or triple when talking about crankbaits! To mitigate this problem I replace only the tail hook on most crankbaits. If a crankbait starts getting bit frequently I’ll pony up an extra Trokar or two on hot baits. Trokar trebles are produced in two versions including a round bend TK300 and also a wide bend or Kahle style TK310. On most crankbaits sizes 6, 5, 4 and 2 hooks are perfect for the job. Many anglers recommend replacing factory treble hooks with larger hooks that feature a wider hook gap. This is a slippery slope as many crankbaits are delicately balanced and changing hook sizes can disrupt the action of these lures. The best advice here is to tread lightly when replacing factory treble hooks on crankbaits. Increasing hooks “one size” is normally acceptable, but going any larger increases the risk of impacting negatively on lure action. For as sharp as premium hooks are, they will eventually get dull from use and need to be sharpened. Trokar hooks feature a knife style cutting edge and are best sharpened using a hook hone. The No. 2 size Octopus or Beak style of hook is the most common design used for walleye live bait rigs. Octopus hooks featuring a turned up eye are ideal for tying snell knots. This hook type allows anglers to position the hooks precisely and also to create rigs with one, two or three hooks. In recent years a bunch of walleye guys have gravitated to using red anodized octopus hooks on their walleye rigs. Using red anodized hooks adds a touch of color to rigs. Unfortunately, the problem with anodizing is it quickly wears off, exposing the natural bronze finish of the hook. Eagle Claw solved this problem by producing power coated octopus hooks in the Lazer Sharp series that come in a host of color options. The durable paint finishes hold up much better than anodizing and gives anglers far more hook color options to choose from. Trokar also produces a octopus hook, but only in the traditional black finish. Hooks are always an issue, but usually the leader on a walleye rig will fail long before the hook is dull and needs sharpening or replacing. The most critical area of the rig to examine is the area between the hooks. Walleye often swim up from behind and nip at the bait, causing them to get hooked on the tail hook. The sharp teeth of the walleye in turn rake back and forth on the leader, quickly shredding the line. Fish tend to break the leader right at the back of the boat as they are thrashing near the surface, or when one hook catches in the net and the fish rolls in the landing net. When nicks and abrasion appear on the leader, it’s time to replace the harness or re-tie using the existing hardware, a fresh piece of fluorocarbon leader and new hooks. One of the least known of the walleye rigging methods is a presentation known as slow death. This ultra slow presentation consists of a half a nightcrawler threaded onto a thin wire No. 2 hook bent in such a way the piece of worm slowly rotates in the water when pulled around 1.0 MPH. Normally the slow death presentation is teamed up with a bottom bouncer and the hook is tied onto about a 40 inch piece of 10-12 pound test fluorocarbon leader. This ultra slow walleye rigging method is ultra deadly on those days that fish aren’t interested in traditional spinner rigs. Most anglers set their slow death rigs exactly the same way as a bottom bouncer and spinner rig. Ideally the bottom bouncer should tick along making contact with the bottom every few feet. Meanwhile, the piece of nightcrawler slowly spins in the water a few inches off bottom. A slow death rig is best fished in a rod holder as a dead stick. Because the rig is moving very slowly and typically the fish are less than fired up when using this set up, it takes a razor sharp hook to stick fish. Most hook manufacturers have thrown their hat into the “slow death” hook market. Eagle Claw’s contribution is a hook known as the Re-Volve and it features the surgically sharp Trokar technology. 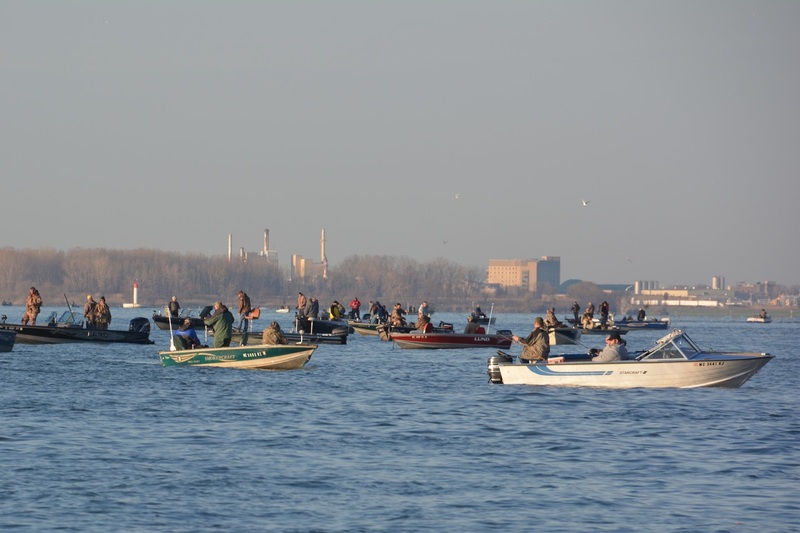 Walleye fishermen don’t generally use or carry a wide assortment of fish hooks. The Fishing 411 crew typically carries just three hook types including trebles, octopus and slow death. Sharpening hooks religiously and using premium hooks is the fast track to walleye fishing success.